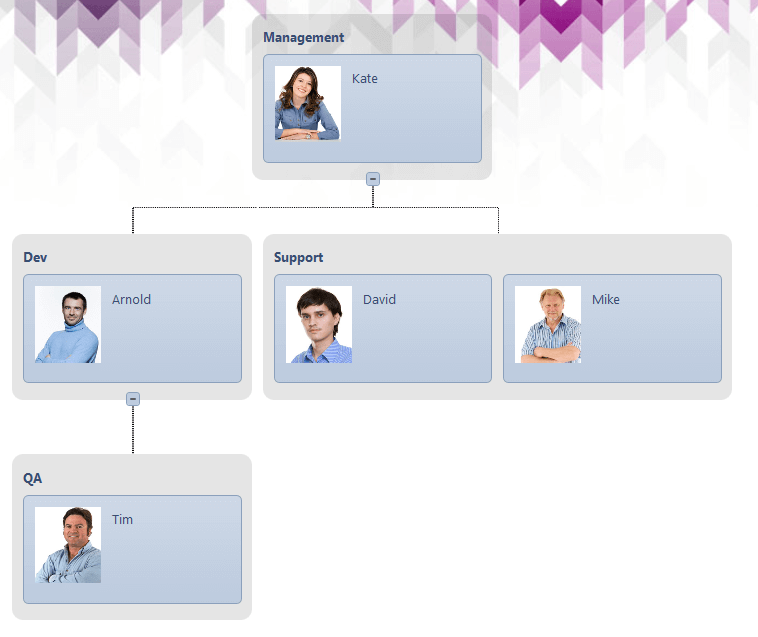 RadOrgChart supports Expand/Collapse of the RadOrgChart hierarchical tree. The functionality could be enabled by setting EnableCollapsing property to true. DataCollapsedField property gets or sets the data field holding the Collapsed property for the currently bound Node. You can set Node's Expand/Collapse state by setting Collapsed property. Here is an example how to enable the Expand/Collapse functionality from the markup. RadOrgChart also supports Expand/Collapse of a Group. The functionality could be enabled by setting EnableGroupCollapsing property to true. The functionality is available when a Node has more than one GroupItem. DataGroupCollapsedField property (in the group-enabled binding settings) gets or sets the data field holding the GroupCollapsed property for the currently bound Node. You can set Group’s Expand/Collapse state by setting GroupCollapsed property of the Node. Here is an example how to enable the Expanding/Collapsing of a Group from the markup. When the PersistExpandCollapseState property is set to true the nodes in RadOrgChart persist their Collapsed and GroupCollapsed state after postback. The default value of the PersistExpandCollapseState is true so if such functionality is not wanted it should be set to false.